When there's no more room in hell, the dead shall walk the Earth. When the dead walk the Earth, they get their asses fragged with grenades. 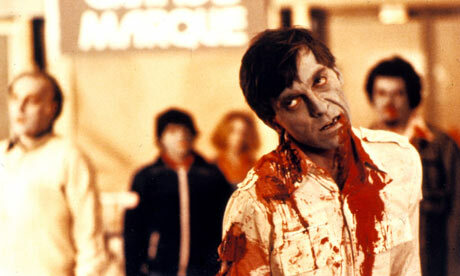 This Saturday, Stuart Lloyd, gamebook maniac and a deft shot with a rifle, will be joining me in a video playthrough of Blood of the Zombies. Mr Ian Livingstone thinks that his fiendish schemes can get one over on us, and how wrong he is. Armed with our wits, luck and lots of firearms, we will bring tears to Livingstone's eyes as we take on his hordes of zombies and living to tell the tale. The video will be live on Sunday, so you can see how we did. Until then, we will be pumping iron, frequenting the firing range and getting our cardio in gear. We're ready for you, Livingstone. 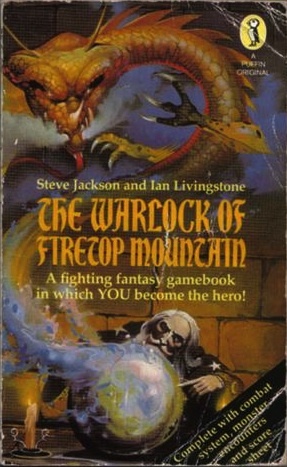 It's been 30 years to the day since the publication of The Warlock of Firetop Mountain, the book that began the Fighting Fantasy legacy. To celebrate, I slung on my backpack, took up my sword and set out into a land of mythic beasts and hallowed forests to find the Warlock himself, Jamie Fry - the editor of the official Fighting Fantasy website and well-known collector. I guess we'll start at the beginning. Where and when did you first come across Fighting Fantasy? In another interview I recall saying it was when I found a copy of Talisman of Death in my local newsagent. However, my memory is a little hazy as it might have been now I think about it a bit more like the Warlock magazine. I lived in a small town in Dorset where I had a paper round. I must have been about 13 or so at the time and hadn’t seen them until then, not even at School. After that discovery I went off to the bookshop in search of the books and never looked back. Being a late starter to the series I had a lot of catching up to do and the Library came in useful after that. Due to limited funds I never did own them all the originals and hence why I had to build up my collection again. What is your favourite book in the series? Always going to stick with House of Hell. I have to say I prefer the earlier ones, probably because Ian and Steve wrote them. Whilst I was at the ‘Blood of the Zombies’ book signing earlier in the month someone had mentioned their favourite being ‘Forest of Doom’ and Ian replied that he wasn’t impressed with the artwork. A few days later I had a run through of the book and remembered it like it was yesterday, so you can add that one to my list. I still walk through a wooded area today thinking something is following me because of that book. Do you have any favourite books that aren't FF? Well I have tried Lone Wolf, Fabled Lands and Legends of Skyfall in the main. I have collected some others, Grailquest, Blood Sword, Duelmaster, The Way of the Tiger etc but have never gotten around to playing them properly. I have got to find time to read DestinyQuest though. What aspect do you enjoy most about FF? It has to be what I can’t do in real life. I can go where I want, do what I want and do it all over again by making different choices. My imagination runs wild when I am reading the books and I immerse my self in that world. I enjoy the collecting, the challenges. What else, everything really. It’s like when I go for a walk, I cannot simply just walk, I look for wildlife, double it up with fossil hunting or throw in a bit metal detecting. Same as a book, much prefer an interactive gamebook where I can write stats down, roll a dice, draw a map etc instead of reading a novel front to back. You're well known as a collector of the series and the author of the Fighting Fantasy Collector's Checklist - what is the most valuable book in your collection? I think it has to be Allansia, closely followed by Revenge of the Vampire (58) and Curse of the Mummy (59). I never know why Allansia commands so much but it has to do with rarity. The original box sets are rare to find as well and can be very expensive to collect. Beyond the books I think artwork is the thing to look out for, not easy to find nor cheap to buy but a delight to own. So not a book but the most expensive item in my collection is an original pen and ink map of Allansia by Leo Hartas from The Riddling Reaver, it is my pride and joy. 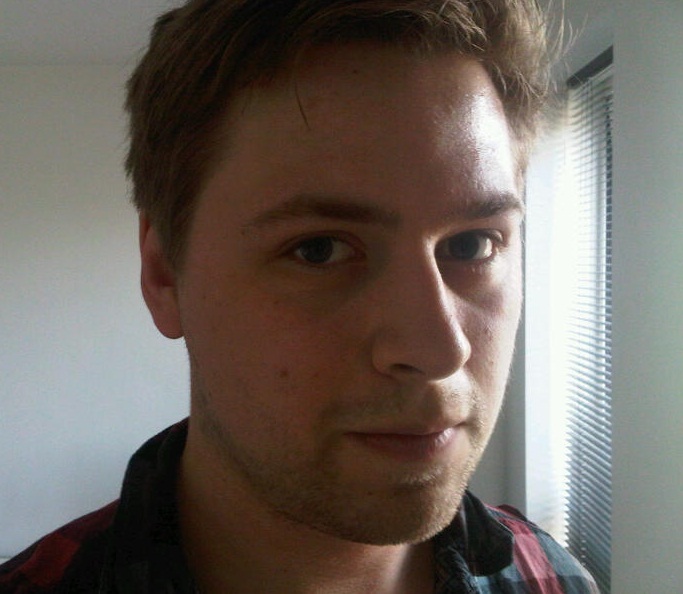 How did you end up becoming the editor of the official Fighting Fantasy website and how did it feel when you got the position? As you can imagine these things do not happen overnight and had to slowly infiltrate the world of gamebooks in order to get close. It all started back in 2002 when I wanted to start up www.fightingfantasycollector.co.uk but new I had to check the position on copyright. I have to say Penguin Books were as much use as a chocolate fireguard, so I hunted both Ian and Steve down to where they were both working at the time and made an approach. Luckily for me they agreed. It wasn’t until 2008 I approached them again with a view to writing the Collector’s Guide, again they had no problem with it and looked forward to seeing it. I then met Steve in 2009 at Gamesfest 4 where I queued like everyone else with a pile of books for him to sign (stuttering) and to show him the latest version of the guide. That day I spent more time with him after the signing for a further ‘chat’, I also met Jonathan Green that day. There has been a recent revival of the gamebook format - why do you think this is? Nostalgia maybe, the new book? There is a generation of 30/40 year olds out there with fond memories, children they want to share the legacy with (and money to spend). I think it has something to do with electronic gaming as well. Playing games such as World of Warcraft and Skyrim amongst others has triggered memories and they go to the loft to dig out those old books. So many tell me this only to find their Mum has thrown them out! Social media has helped immensely. I have found it so much easier to promote FF through this media than any other way and the great thing is you can get the hype going, someone passes it on and it just spreads. The iOS and android versions allow people to access them in a different way. Have you ever dabbled in tabletop roleplaying - Advanced Fighting Fantasy perhaps? I dabbled in a Dungeons and Dragons lunchtime club at School but stuck to sneaking a read of whatever Fighting Fantasy book I had in my bag at the time to avoid getting picked on. Sadly, I have never played the Advanced FF system, maybe someone could change that. Later in life I have enjoyed playing Heroquest and the advanced system from time to time. I changed direction for a while to collect and paint miniatures. Where do you see the series going in the future - will there be more book releases? Initially, Thanks to Tin Man Games we are going to see a revival of some of the original titles in iOS and Android formats, who knows they might even bring them to PC. I have been campaigning for some merchandise to be produced but no new books on the table at the moment, although Ian talks about writing one with Steve for the 40th Anniversary but I think you will agree that is way to far away. Ian wrote this one out of loyalty to the fans as he felt they were the true reason the series is still alive today. 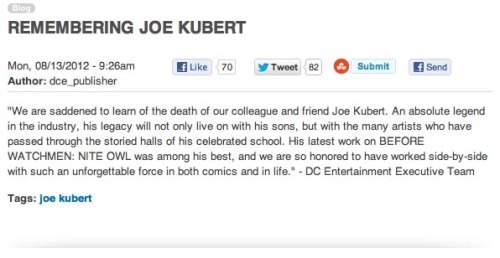 With that in mind, if you all shout loud enough maybe you will inspire him and Steve to re-consider the position. Finally, any juicy news that you care to share with us? You will have to roll a d6 and test your luck I am afraid. Nothing concrete is the honest answer, even if I did know anything I would not be able to tell you. We get lots of proposals as you can imagine but at the moment nothing to report. Lets hope someone invests in the interactive House of Hell movie sometime soon or something similar hey? When I came up with the USR system, I wanted something that is quick to get onto the table and requires very little rulebook referencing, but also a game that's modular, allowing players to build on the system. As fantasy is one of the most poplar genres for roleplaying, I've been kicking around ideas for a magic system, spurred on by Tabletop Diversions' D&D B/X USR conversion. Above all, magic rules for USR should be simple and broad, allowing for imagination to take precedent. I've always loved the magic system presented in Barbarians of Lemuria, which has a freeform feel, so that's the kind of system I'd like to emulate. But before we can get into the nitty-gritty, we need to look at the current rules, and more specifically ability scores. USR has three main attributes: Action, Ego and Wits. Classically, wizards and other such magic users tend to draw their spells from their intelligence, pouring over books for days in a vast library. USR's 'intelligence' equivalent is Wits, so it's possible to base magic off this attribute. Minor Spell: A small incantation with a minor effect. Examples - create a small light, move a 20lb object with your mind, create a pool of water. Minor Spells cannot do damage. Advanced Spell: A grander spell that is able to inflict a small amount of damage or change the form of an object. Examples - create a 5ft fire, move a 100lb object, turn an object invisible, reinforce a door, dis-spell a harmful enchantment, throw a fireball. Advanced Spells can cause 1d6 damage. Major Spell: A powerful spell with a large effect. These spells can cause great damage. Examples - curse an enemy, turn the party invisible, create stone skin, disintegrate an enemy, create a huge flood, fly 50 miles. Major Spells cause 5d6 damage or can outright destroy enemies. Obviously, minors are very easy to cast and majors incredibly difficult. Magic users can use focus equipment to make it easier to cast a spell. A wand or staff gives a +1 to the casting roll. Rarer magical items worth a lot of money will give a +2. Of course, there's the problem that the wizard could just overuse spells out of combat, constantly rolling until they get a 10, so we need something to prevent that from happening. I like the type of sorcerers that have to do crazy rituals involving sacrifices and paraphernalia, so perhaps the wizard has to meet pre-requisites in order to cast a spell. Minor Spell Prerequisite: Ability to speak and/or gesticulate with at least one hand. Advanced Spell Prerequisite: Cutting own hand with a dagger (-2 Hits), two minutes of chanting and incense burning. In this way, wizards will have to think about how and when they will use a spell. This is only rough, but I will be making a full magic system available shortly. 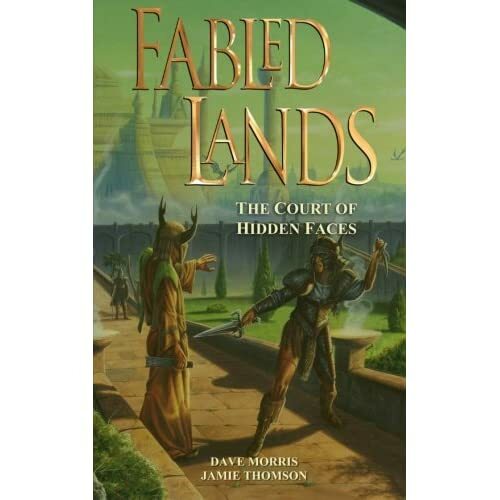 Fabled Lands: The Court of Hidden Faces has launched on Amazon, making it the 5th book in the series to be re-released. 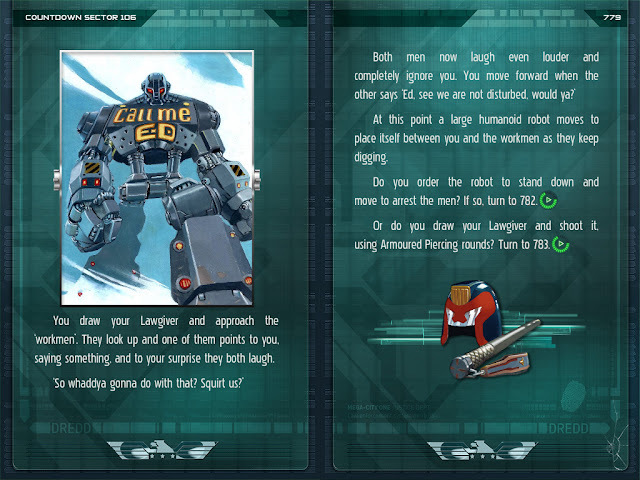 The gamebook, famous for its huge scope and sandbox gameplay, can be played as a standalone game or along with the other books in the series, allowing the player to explore more of the world created by Dave Morris. Set out on a journey of unlimited adventure! FABLED LANDS is an epic FIGHTING FANTASY type gamebook series with the scope of a world like SKYRIM. You can choose to be an explorer, merchant, priest, scholar or soldier of fortune. You can buy a ship or a townhouse, join a temple, undertake desperate adventures in the wilderness or embroil yourself in court intrigues and the sudden violence of city backstreets. You can undertake missions that will earn you allies and enemies, or you can remain a free agent. With thousands of numbered sections to explore, the choices are all yours. At the Court of Hidden Faces, no one is who they seem. The sinister lords of the Uttakin go masked to hide their treachery. 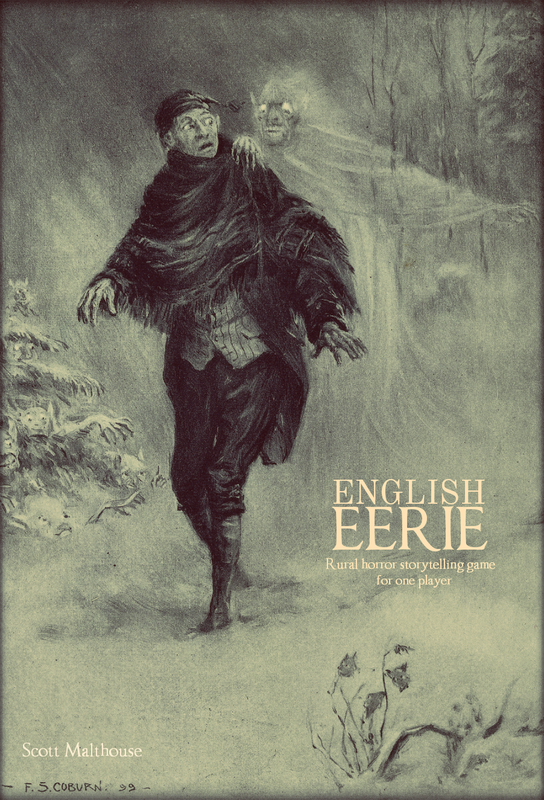 The secret police of the god Ebron kill those who flout their fanatical codes. In this tyrannical realm of betrayal and assassination, life is cheap. But rich rewards await the adventurer courageous enough to penetrate this hostile land. Your fate is in your own hands. You choose your skills, your goals, where you will venture and what you will do. The only limit is your imagination. The choices are all yours. And success will give you the powers to venture ever deeper into the amazing role-playing world that is Fabled Lands. Is that Mordred I spy? 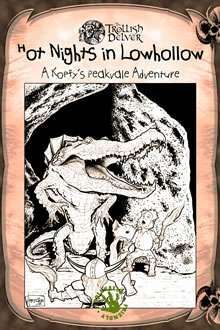 Tom K Loney has released his new adventure in Peryton's Trollish Delver line of Tunnels & Trolls scenarios called Hot Nights in Lowhollow. Hot Nights is the third GM adventure set in Peakvale, a kingdom torn apart by civil unrest and weird happenings. "Finally back to town after a hard day's tunnel hacking? Well, there might be a bit more going on than you expect. Lowhollow isn’t the sprawling, kingdom-sized area of urban settlement that Pholus and Estvol are, but it has a sizeable population bolstered by land and seafaring trade routes. Have as much adventure in the city as out in the wilds. Delvers in Lowhollow explore not only the dingy side of the city, but the consequences of getting caught. If you get too careless while you're dreaming of the riches of the harbor district, you could very well end up working the Pitt. This is an adventure setting for common kindred delvers of levels 3 to 5 using 7.5 edition rules, although it is easy to modify for 5th and other editions." This city adventure gives the GM plenty of options to run their own series of scenarios in the city of Lowhollow, providing an easy framework for the GM to work from. Peryton veteran Mark Hartlieb lends his artistic skills to Hot Nights, with an awesome cover. So go and buy it, for it is excellent! Big Blue Bubble have announced that they will be removing their Fighting Fantasy games from iTunes on the 14th August. Titles include The Warlock of Firetop Mountain, Deathtrap Dungeon, Citadel of Chaos, City of Thieves and Creature of Havoc. Big Blue Bubble commented: "The agreement that we made was for a specific amount of time and that time is now lapsed. I am not aware of the apps being picked up or ported by anyone else." However, late last year it was revealed that Gears of War publisher Epic Games had secured the rights to make four Fighting Fantasy titles for iOS: The Warlock of Firetop Mountain, The Citadel of Chaos, Deathtrap Dungeon and Armies of Death. Tin Man Games will also be releasing the latest book in the series, Blood of the Zombies, this month. Tavernmaster Games have released two new solo adventures for Tunnels and Trolls, Rapscallion and Sideshow. 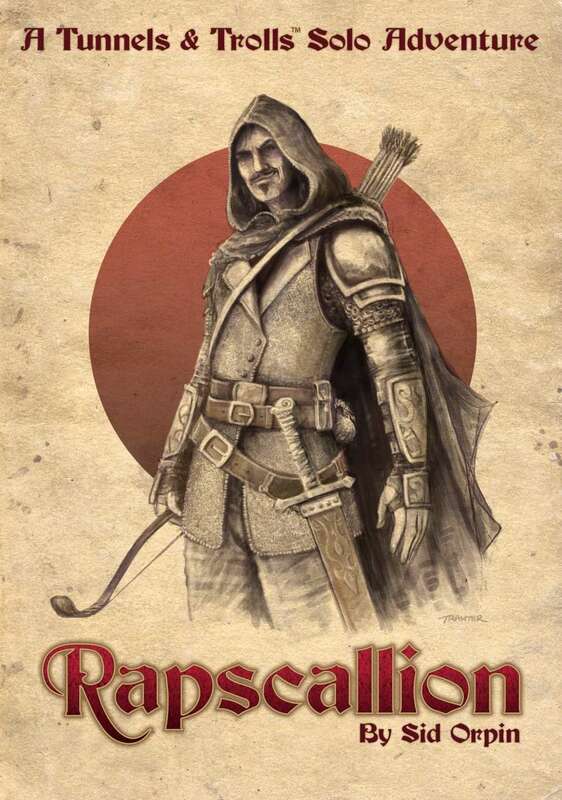 Rapscallion, by Sid Orpin, that has you play as a rogue who is saved from death by the god of rogues, Ylsenor and forced to entertain the great Dissembler in order to prove you are worthy. There are very few rogue-based solo adventures, so this one should be interesting. The second adventure, Sideshow, penned by Andy Holmes, is a mini solo adventure for 5th edition, although it can be scaled up. In it, your adventurer comes across a range of colourful tents at the quiet part of town where things may not be all as they seem. Tunnels and Trolls continues to enjoy a frequent release of material and with the new Deluxe edition on the horizon, hopefully there will be even more interest in this amazing game. There's no doubt that Edgar Rice Burroughs' enduring sword and planet classic, John Carter of Mars, has influenced an incredible amount of science fiction tales since, including the Star Wars series, so one would have thought that a film adaptation would have been primed to set the screens alight and the cash counters chiming. What actually happened was 'John Carter', a bewildering truncated title that carries little inspiration, tanked at the box office and created a small tear in Disney's wallet. Mix this with varied critical reviews and a mere scraping of marketing and you have one very unsuccessful film, even if by rights it should have done very well. However much the critics think the movie failed, there's one thing that's certain: the soundtrack is very good. 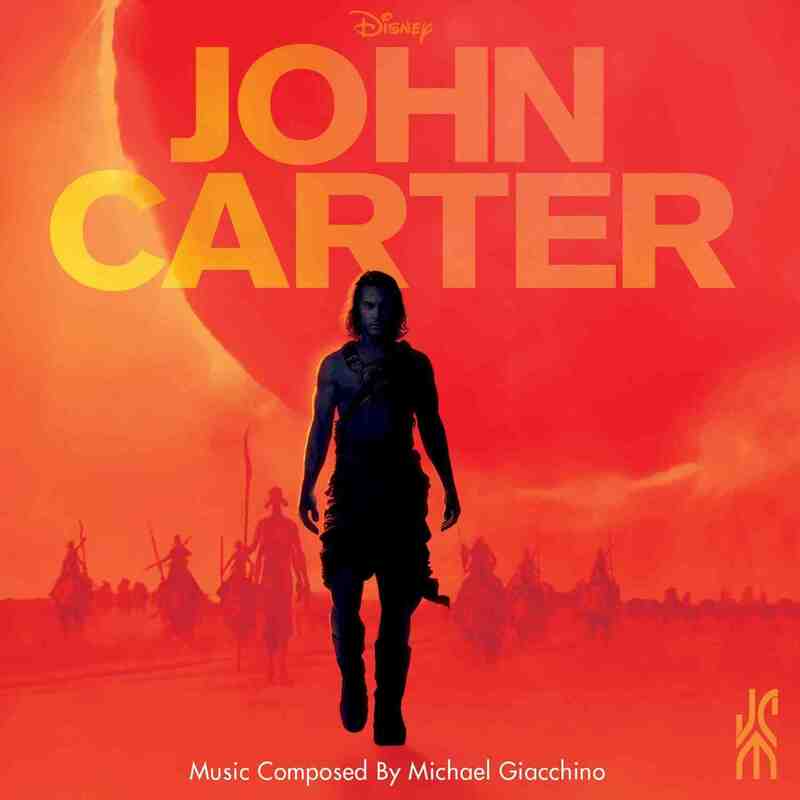 Michael Giacchino, who valiantly showed off his composing chops on J.J. Abrams' 'Star Trek' and has had a long history of contributing to the famed director's work including 'Lost' and 'Super 8', brings his A-game to 'John Carter'. Giacchino re-invigorates the essence of 80s adventure flicks, hearkening back to John Williams without outright copying him. You can hear a tinge of Lawrence of Arabia here, especially in 'Get Carter', a dramatic cue with layers of thundering horns, sweeping melody and subdued vocals towards the end. It's an exciting cue with a beginning, middle and end and a theme that's lightly echoed with violin and piano in 'Gravity of the Situation' where the danger inherent in 'Get Carter' makes way for a sense of wonderment. This is pure fantastical space opera, filled with over-the-top excitement ('The Prize is Barsoom'), dazzling romance ('A Change of Heart') and the mystery of a new world ('Thark Side of Barsoom'). Giacchino does a great job of blending the film's themes together, conjuring the feeling of a great pulp adventure - which is exactly what this film needed. This is a melodic and sweeping affair that does feels like John Williams, but that really isn't a bad thing. Marvel have been releasing teasers over on iFanboy giving hints about which writers will be taking over titles such as Captain America and Deadpool when Marvel NOW hits stores later this year. The latest teaser tells us that Ed Brubaker will be replaced by Rick Remender, known for his recent work on Venom and Secret Avengers. John Romita Jr will also be taking over art detail this November, his first time on the title since Fallen Son: The Death of Captain America in 2007. Previous teasers include Matt Fraction and Mark Bagley on Fantastic Four, Jason Aaron and Esad Ribic on Thor and Kieron Gillan and Greg Land on Invincible Iron Man. This shake-up of creative teams should provide some interesting results, but fan favourite Brubaker will likely be missed on one of Marvel's flagship titles. Right now in London, Ian Livingstone will be setting out his table and stacks of Blood of the Zombies, ready to greet a parade of fresh-faced young kids and grizzled Fighting Fantasy veterans who shiver at the word 'Ganjees'. Now gamebooks are hot again, thanks to tablets and iPhones, the original series is back in the spotlight and a new wave of gamers are tasting the delights of chucking magic powder at Zanbar Bone. A friend of mine and member of my gaming group is a teacher who once mentioned to be that he used Fighting Fantasy in the classroom. This is a brilliant idea and I propose every teacher adds it to their class at some point, and here's why. Fighting Fantasy relies on reading comprehension, mathematics and problem-solving - everything that a child should learn, but in an exciting way. Say you're wanting to teach about probability, FF has you covered. The kids have a LUCK score of 7 and they have to roll 7 or under to avoid being turned to stone by a basilisk, so they must work out the probability of rolling that number or lower. Simple addition and subtraction is used in combat, so instead of giving them a tired old "how many beans does Janine have?" pit them against a cockatrice. Have one of the kids read out the passage depending on the outcome. Steve Jackson, the series' co-founder, actually invented a great downloadable teaching aid that works a lot like this. It gets pupils writing lengthy descriptions of their favourite monsters and even tests their artistic abilities with creature drawings. Few things fire up a child's imagination like fantasy and the best form of learning is when you don't even realise you're learning - it's all integrated into something incredibly fun. Maybe we will even teach a whole new generation how to destroy Zanbar Bone. The teaser trailer for Merlin's fifth season has hit the internet, and it seems that we will be seeing more darkness and lots of dragons. Set to Knights of Cydonia by Muse, the new trailer gives us a quick glimpse into what we can expect when the new season hits UK screens on September 29th, including horrific creatures, more Morgana and the fabled round table. We will return to Camelot three years after the events of last season, which saw Morgana and Helios conquer Camelot and Arthur relinquish the sword from the stone. Now, Morgana, who has been captive for three years, has befriended Aithusa the white dragon and Queen Guinevere is giving counsel to Arthur. 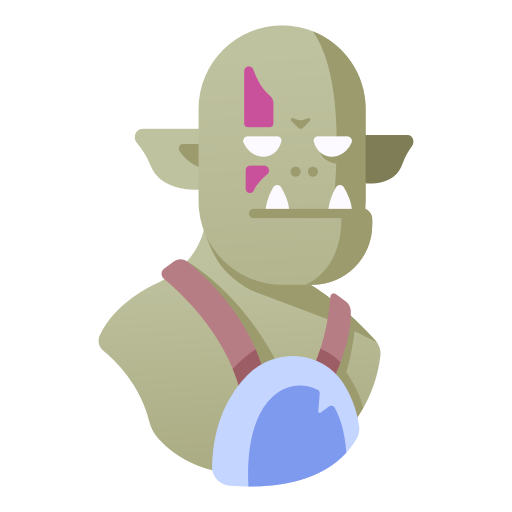 This year, Trollish Delver will be re-capping episodes from season 5.